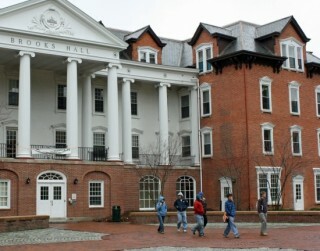 On the Allegheny College campus in Meadville, Pennsylvania. Too often these days, you hear about frictions between colleges and the communities they're located in. But my visit to Allegheny College in the northwestern Pennsylvania city of Meadville (population 13,253) proved this doesn't have to be the case. Indeed, the relationship between Meadville, Crawford County, and Allegheny College is best viewed as a partnership that brings benefits to all. Let me back up first. 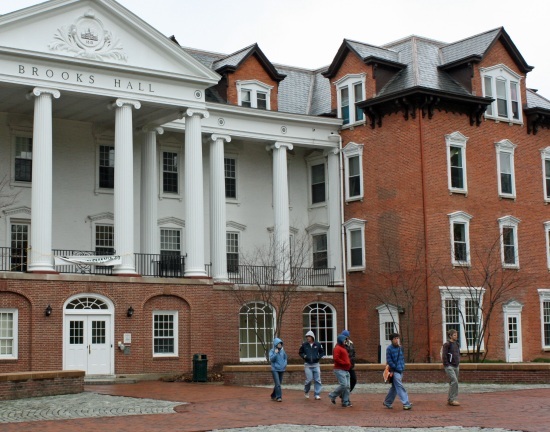 Allegheny College is a small, well-respected liberal arts school, with an enrollment of 2,100. 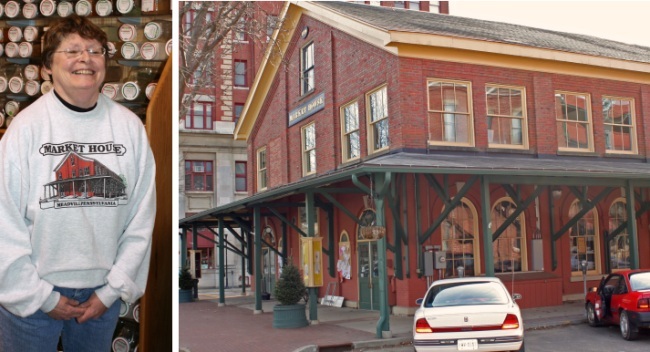 Meadville is a city with a strong industrial heritage. County Commissioner Morris Waid described to me how the area was stunned back in the mid 1980's when two of its largest manufacturers closed down, putting over 2,000 people out of work. 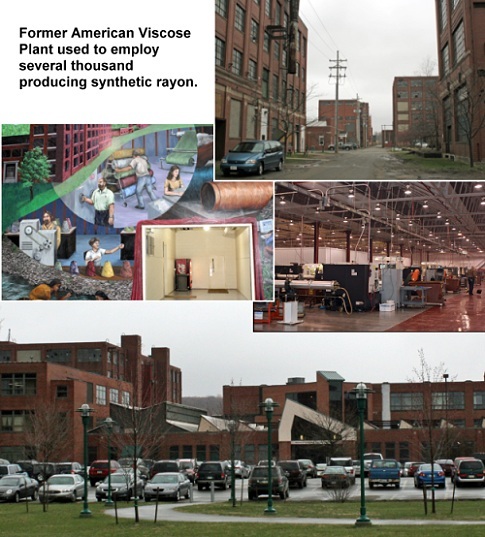 Photos above show some of rehab of the huge (1.4 million square foot) American Viscose plant in Meadville -- Pennsylvania's first brownfields restoration project; over 20 businesses employing 900 workers now occupy 900,000 square feet of this space, including Acutec Precision Machining and Universal Well Services. The wall art was an Allegheny College project illustrating some of the plant's heritage. Over the past decade, the paths taken by the city and county in their efforts at economic recovery and by the college in its focus on student "service learning," have become increasingly intertwined. Amara Geffen is an artist and professor of art (since 1982) at Allegheny College. Twelve years ago she became involved in the creation of an interdisciplinary environmental studies program. And, before you ask the question, the answer is "yes, there's a link between art and the environment." 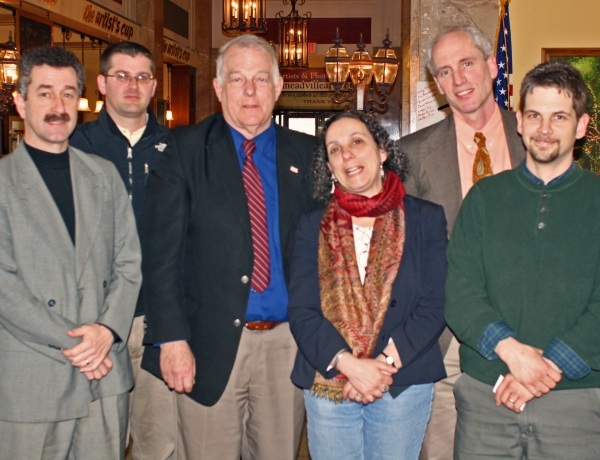 Many of the faculty participating in the environmental studies program were interested in applied learning opportunities. This led, in turn, to the creation of the Center for Environmental and Economic Development, or "CEED" as its called, which Geffen now directs. 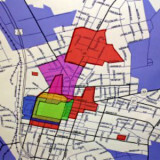 As Geffen explained, the CEED program was aimed at linking students with the Meadville community, with a focus on projects involving "sustainability." "CEED has provided a mechanism for place-based education tied to the educational curriculum," she told me. When Geffen saw my puzzled look, she added, "think of it as an applied liberal arts education where students learn by being engaged with the community while working on different projects." Elise Swanekamp is an Allegheny College freshman, already active in CEED. She's from West Seneca, New York, and was drawn to Allegheny in large part by the school's reputation for service learning and its political participation programs. She's particularly interested in working with area farmers and finding ways of helping them out. Right now, she's involved in assisting the downtown farmers' market. In fact, Geffen took a ten minute time-out from her meeting with me to go over the design and contents of a brochure Swanekamp has been working on for the downtown Meadville Market House-- the oldest continuously operating market house in Pennsylvania (since 1870). As Swanekamp told me, working on projects like this will help her gain valuable experience. "Volunteering at a soup kitchen is great, but I wanted to extend my effectiveness into the community." Allegheny students last year put in a remarkable 25,000 hours of time on service learning projects. Some 60 percent of students participate in community service and/or community-centered learning activities. 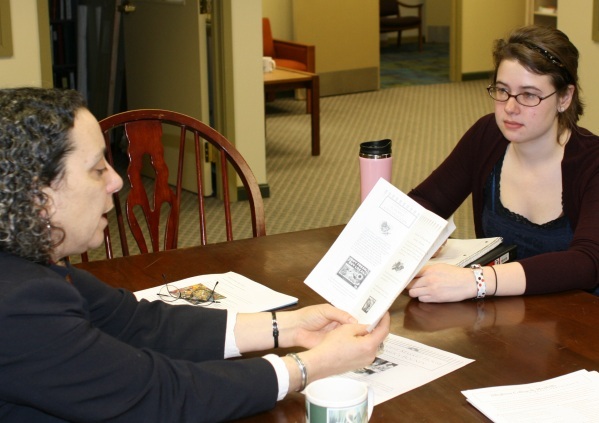 But at Allegheny College it's not just students who are actively involved with the community, it's also faculty. Twenty-four faculty members have participated in the College's "Community Based Research" program. One of several examples that Geffen related to me involved a faculty member who recently worked with the City to write up a grant proposal for a greenhouse gas inventory of the city. Another faculty member has worked with the Crawford County Head Start program on developing and conducting a community survey. Another key element in cementing the working partnership between city (and county) and college has been through Pennsylvania's Keystone Innovation Zone ("KIZ") program. 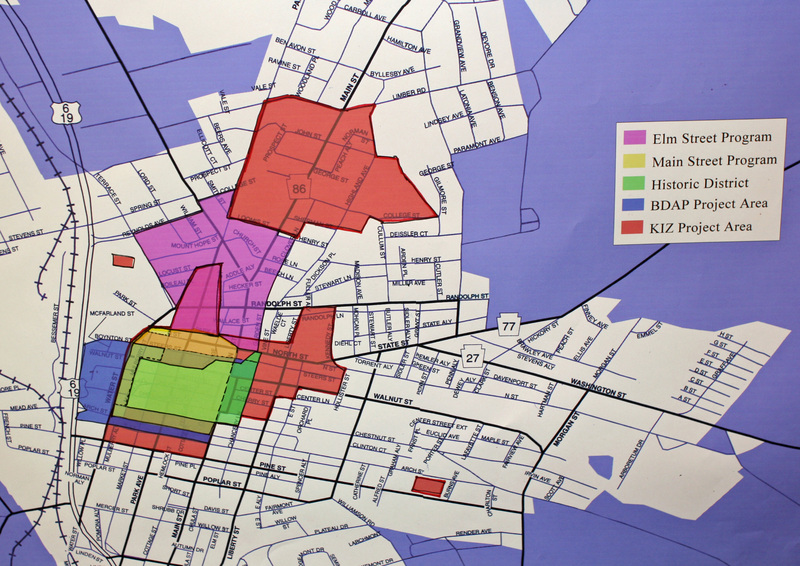 The map on the right shows KIZ zones within Meadville in light red (green is the historic district). As County Commissioner Morris Waid told me, the goal of the KIZ is for "faculty to have a way to bring their research into the marketplace." Eligible businesses in designated KIZ's can gain valuable tax credits and small grants. They also gain access to paid interns, such as students at Allegheny and other area colleges. One point that nearly everyone I met with in Meadville made is that the community has a strong "sense of place. "Indeed, the CEED program and Allegheny College's commitment to the city and county is evidence of the value it puts on this place. As Crawford County Planning Director Jack Lynch added, "this is also a pretty pro-active place, with strong collaboration between government, business, and the academic community." I'll return with another story about Allegheny College and Meadville in my next post. The Artist's Cup in Meadville, Pennsylvania. just a quick p.s. 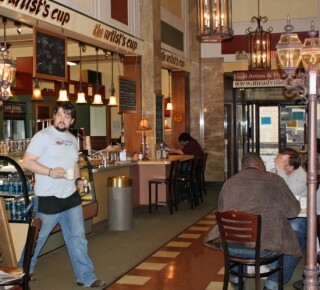 for those of you following my search for that strong cup of morning coffee -- you can hit the jackpot in Meadville at the Artist's Cup, located inside what used to be a bank. With a local artists' gallery also inside, it's a great meeting place in Meadville (it's also where our group met for lunch).